In preparation for painting a Zulu Wars British Force, I tested the 9 white acrylic and 2 enamel paints I own for opacity (ability to cover black). Obviously this test is not comprehensive. I’ll probably add to it if I get more paints. I’ll add photos later. I painted a single layer, double layer and triple layer of each paint on a sheet of white 24 lb paper. The paper had solid black areas to test the paint’s opacity over a black basecoat. I used a Rosemary & Co. flat brush. Vallejo Model Color 951 White B/A+/A+ The brightest and best white. Completely covered black with 2 layers. Vallejo Model Color 919 Foundation C/B/A- A disappointing paint. Reaper HD Solid White B/A-/A A good white paint. Craft Smart Matte White A-/A/A A surprisingly good paint. Unthinned, it’s equal to VMC 951 White. Thinned, it drops to B/B/A- which makes it a tad better than Citadel White Scar. Folk Art Titanium White A-/A/A A surprisingly good paint. Equal to Craft Smart White but costs more than double. Unthinned, it’s equal to VMC 951 White. Thinned, it drops to B/B/A- which makes it a tad better than Citadel White Scar. Citadel Ceramite White B-/A/A Excellent opacity for a white, but noticeably drabber than the other whites. Citadel Scar White B-/B/A- Brighter than Citadel Ceramite White, but no advantage over VMC 951 White. Craft Smart Premium Satin White C-/B/B+ Disappointing performance despite costing twice as much as the normla Craft Smart Matte paints. Thinned, it drops to D/C/C. Craft Smart Paint Pen (water based) C/B/B – painted a line only. Testor’s Flat White Enamel (oil based) A-/A-/A- Best single layer coverage of any white, but you can’t add additional layers unless you let it cure for at least 24 hours. Given the hassle of messing with enamels, I’d rather use acrylics and put 2 layers down. 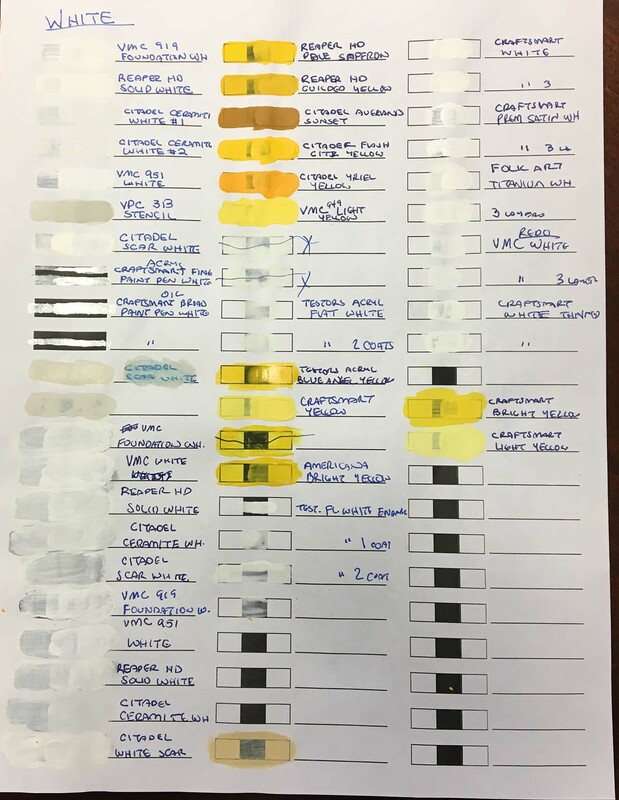 I tested the Testor’s because I used to be a dedicated enamel paint user. I grudgingly changed to acrylics and have found them wanting compared to enamels. However, this test pretty convincingly showed that the best acrylics are getting close to the enamels. The VMC 951 White was the best color in the test, but the Craft Smart Matte White did surprisingly well. Even thinned, it’s better than the Citadel Scar White.